Pease, D.E. (2018). Cold War. In S. Bronner (Ed. ), Encyclopedia of American studies. [Online]. Johns Hopkins University Press. Available from: https://search.credoreference.com/content/topic/cold_war [Accessed 25 April 2019]. Pease, Donald E. "Cold War." Encyclopedia of American Studies, edited by Simon Bronner, Johns Hopkins University Press, 1st edition, 2018. Credo Reference, https://search.credoreference.com/content/topic/cold_war. Accessed 25 Apr. 2019. A state of tension, distrust and mutual hostility between states or groups of countries, without recourse to actual warfare. The state existed between the Soviet bloc countries and the Western world from the end of the Second World War until 1990. The term was first used in a speech made on 16 April 1947 by the US financier Bernard Baruch (1870-1965), when US ambassador to the United Nations Atomic Energy Commission, and is said to have been suggested to him by Herbert B. Swope, former editor of the New York World. See also NATO; Warsaw Pact. George Orwell first used the term cold war in a 1945 article entitled You and the Atom Bomb, which described the United States, Russia, and China as postwar “superstates” whose nuclear arsenals would involve them in a permanent state of cold war. Orwell borrowed this phrase from the French la guerre froide (“the cold war”), which he translated as a state of war that lacked the overt conditions of war. The term entered the American lexicon in 1947 following the publication of the political commentator Walter Lippmann's The Cold War. Lippmann had written the book in response to The Sources of Soviet Conduct, an essay that the diplomat George Kennan had published that year in the journal Foreign Affairs under the signature Mr. X. It was in this essay that Kennan recommended that the United States adopt a policy of containment to curb the threat of Russian expansionism. Lippmann invoked historical evidence to disagree with Kennan's contention that Russia posed a danger to the international order. Arguing that Russian nationalism was far more important to Soviet policymakers than international communism, Lippmann concluded that the United States could not afford to police the world. But the atmosphere of mutual suspicion and fear then enveloping the globe favored Kennan's recommendations over Lippmann's refutations of them, and for the next half century the world's geography was separated along a symbolic East-West divide, which transformed the West into an imaginary community of democratic states united in their defense of universal values against the incursions of world communism. The policy of containment tacitly empowered the United States and Russia to remap the borderlines of territories according to ideological rather than spatial coordinates. Throughout the cold war, developing countries acquired significance through their alignment on one or the other side of these opposed ideological systems. The global hegemons thereafter supplanted the political arrangements of the complex societies they occupied with the systems of representation through which they administered and controlled their territories. As evidenced by their placement of the Asian nations of Japan, Korea, and Vietnam within the symbolic geography of the West and the Central and South American nations of Cuba, Nicaragua, and Chile within that of the East, however, the efforts of cold war cartographers to redraw the world map at times produced highly disorienting effects. In addition to establishing the coordinates of U.S. foreign policy, the cold war also dramatically reorganized U.S. domestic life. When President Harry Truman signed National Security Council (NSC) document number sixty-eight (NSC68) into law in 1950, he invoked the need for the containment of communism at home as well as abroad as the official rationale for a national security state. With NSC68 Truman inaugurated a cold war nation-state that correlated domestic policies and national security interests and transformed the foreign policy of Americanization abroad into an instrument for securing domestic solidarity. There is a basic conflict, said Truman, between the idea of freedom under a government of laws and the idea of slavery under the grim oligarchy of the Kremlin. Truman intended that this declaration of an imaginary war with the Kremlin would solicit from American citizens the willingness in peacetime to subordinate themselves to wartime emergency measures. When it shifted its area of concern to the sphere of culture, however, the discourse of containment did not restrict its operations to the regulation of domestic communists. After President Truman signed an executive order banishing gays and lesbians from federal employment in 1950, the cultural terrain over which containment exercised its policing powers expanded to include the regulation of sexual norms, race relations, social movements, civil rights, artistic expression, and gendered hierarchies. The alarm with which the nation's writers and artists responded to McCarthyism, and their disaffection with the radical politics of the Popular Front, precipitated a massive shift in political loyalties. Flannery O'Connor, Norman Mailer, Jackson Pollock, James Baldwin, Arthur Miller, and Ralph Ellison abandoned the New Deal's ethos of populist sentimentality and embraced what Lionel Trilling described as the tragic ambiguity of political and moral decisions. The “consensus school” of historians that emerged in the 1950s fostered a political attitude that tempered the worst excesses of the strategy of containment. Arthur Schlesinger, Daniel Boorstin, and Louis Hartz described McCarthyism and communism as related forms of ideological reasoning that were antithetical to the “practical genius” of American liberalism. In 1957 Daniel Bell introduced the slogan the end of ideology to distinguish America's tolerance of dissent, embrace of multiple points of view, and willingness to compromise from Russia's commitment to the infallibility of the Marxist dialectic and its equation of dissent with treason. But the consensus school of history might itself be described as having provided an ideological cover for the policy of containment. When consensus historians proposed that their historical analyses be submitted to the tenets of pragmatic thought, they frequently confused pragmatism's tenets with the reason of state. The consensus and the cold-war mentality both underwent severe changes in the period between 1963 and 1974. Their breakdown was precipitated by such enormous political events as the Cuban missile crisis; the assassinations of John and Robert Kennedy, Malcolm X, and Martin Luther King, Jr.; détente; President Nixon's China visit; the Watergate trial; and Nixon's resignation from office. But when the free speech movement joined forces with the opposition to the war in Vietnam, the resultant coalition of oppositional forces produced profound challenges to the foundational assumptions of the cold-war mentality. In place of ratifying basic Americanist values, the counterculture struggled for liberation from them. Including the perspectives of women, as well as the racial and sexual minorities who had been the victims of the state's repressive policies during the cold war, such revisionist historians as William Appleman Williams and Howard Zinn challenged the official explanations of the consensus school of United States history. Noam Chomsky resurrected Walter Lippmann's argument that America's motives for entering into a cold war had more to do with control of foreign markets and the control of global resources than the defense of democratic freedoms. Chomsky discerned a congruence between the repressive regimes that the United States had established throughout the developing world and its policing of domestic minorities. In 1979 E. L. Doctorow retold the history of the cold war epoch from the revisionists' perspective in The Book of Daniel. The political upheavals of the 1960s and 1970s left the cold war in a moribund condition. But the cold war would undergo an eight-year revival during Ronald Reagan's presidency and just before the dismantling of the Berlin wall in November 1989. Recalling eschatological themes from the Book of the Apocalypse, Reagan claimed the Bible as the ultimate authority for the United States's possible use of nuclear weapons against the Soviet Union. We are about to undergo a dreadful period of suffering, Reagan confided to some visiting theologians, in connection with the extraordinarily violent struggle between the forces of good and evil that is to precede the return of Jesus and the millennium of his rule. But in place of the global nuclear Armageddon that Reagan, along with many other authorities, had foreordained, the evil empire collapsed as a consequence of the loss of totalitarian communist control. This terminal event dismantled the narrative of containment on which the cold war had been founded. Among several other consequences this ending posed a problem of historical closure. The nation's subsequent entry into a global economic order displaced the grounding assumptions that had constituted its coherence. Entry into the new world order did not conclusively sum up the historical purpose of the preceding fifty years. The events that had taken place during the cold war simply ceased happening, and the narratives that had endowed historical events with their intelligibility simply broke off. At the end of the cold war, the provision of an appropriate formal closure would have performed the essential political function of providing a model of order capable of bringing its end into concordance with its beginning. The absence of an ending consonant with the nation's official account of its beginning has animated the fear of a disintegrating state. United States citizens have responded variously to the disappearance of the symbolic structures in which they had constituted their national identities. In an effort to supply a conclusion, Francis Fukuyama has proposed the phrase the end of history as a way to conceptualize the cold war as the accomplishment of the historical destiny of the West through the realization of the universal truths of equality. But like the consensus historians' term the end of ideology, Fukuyama's the end of history has only reassembled capitalism versus totalitarianism into a new cognitive map that would oppose free market ideologies of vanguard Western states to the socioeconomic arrangements of the rest of the globe. Whether the cold war has in fact ended or has simply been refunctioned as the core discourse of globalization remains to be seen. 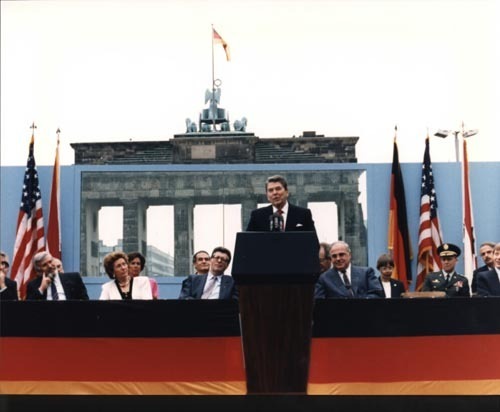 U.S. President Ronald Reagan speaking in front of the Brandenburg Gate and the Berlin Wall. June 12, 1987. White House Photographic Office. Ronald Reagan Presidential Library. Wikimedia Commons. 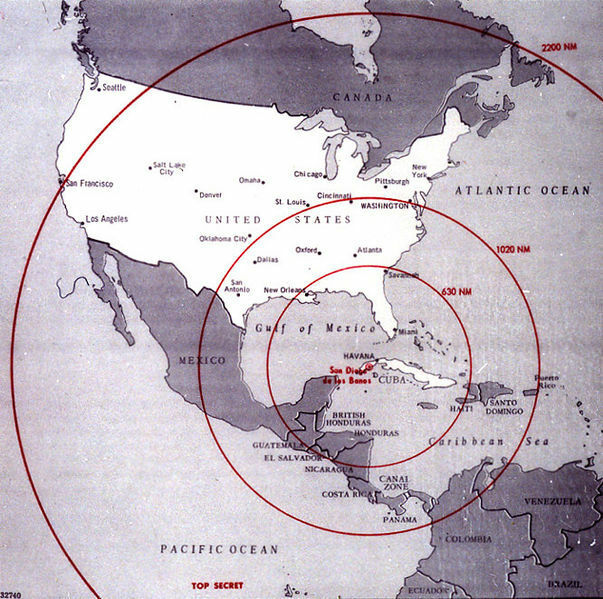 Map of the western hemisphere showing the full range of the nuclear missiles under construction in Cuba, used during the secret meetings on the Cuban crisis, 1962. The John F. Kennedy Presidential Library and Museum. Wikimedia Commons. 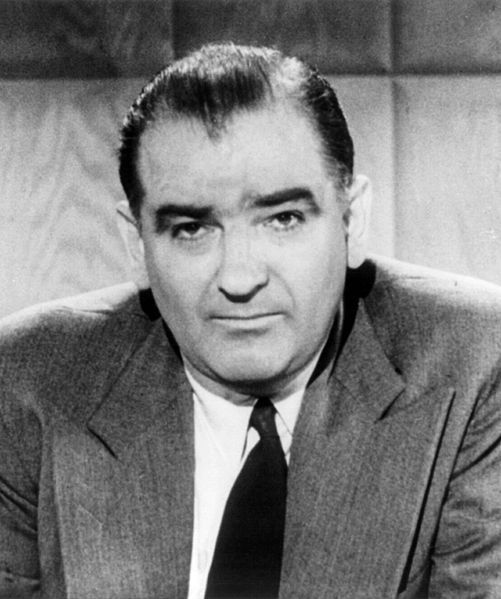 Joseph Raymond McCarthy. 1954. United Press. Library of Congress. Boyer, Paul, When Time Shall Be No More: Prophecy Belief in Modern American Culture (Harvard Univ. Press 1992). Craig, Campbell; Sergey S. Radchenko, The Atomic Bomb and the Origins of the Cold War (Yale Univ. Press). Doherty, Thomas, Cold War, Cool Medium: Television, McCarthyism, and American Culture (Columbia Univ. Press 2003). Dudziak, Mary L., Cold War Civil Rights: Race and the Image of American Democracy (Princeton Univ. Press 2002). Engel, Jeffrey A., Cold War at 30,000 Feet: The Anglo-American Fight for Aviation Supremacy (Harvard Univ. Press 2007). Heefner, Gretchen, The Missile Next Door: The Minuteman in the American Heartland (Harvard Univ. Press 2012). Higgs, Robert, Depression, War, and Cold War: Studies in Political Economy (Oxford 2006). Hogan, Michael, ed., The End of the Cold War: Its Meaning and Implications (Cambridge 1992). Isaac, Joel; Duncan Bell, eds., Uncertain Empire: American History and the Idea of the Cold War (Oxford 2012). Johnson, David K., The Lavender Scare: The Cold War Persecution of Gays and Lesbians in the Federal Government (Univ. of Chicago Press 2006). Kennan, George, The Sources of Soviet Conduct, Foreign Affairs 25 (1947):568-582. Lippmann, Walter, The Cold War: A Study in U.S. Foreign Policy (Harper 1947). Nadel, Alan, Containment Culture: American Narrative, Postmodernism, and the Atomic Age (Duke Univ. Press 1995). Osgood, Kenneth, Total Cold War: Eisenhower's Secret Propaganda Battle at Home and Abroad (Univ. Press of Kan. 2008). Schaub, Thomas, American Fiction in the Cold War (Univ. of Wis. Press 1991). Schrecker, Ellen W., No Ivory Tower: McCarthyism and the Universities (Oxford 1986). Vegso, Roland, The Naked Communist: Cold War Modernism and the Politics of Popular Culture (Fordham Univ. Press 2012). Westad, Odd Arne, The Global Cold War: Third World Interventions and the Making of Our Times (Cambridge 2007). Wiener, Jon, How We Forgot the Cold War: A Historical Journey across America (Univ. of Calif. Press 2012). Whitfield, Stephen J., The Culture of the Cold War (Johns Hopkins Univ. Press 1991). Wood, Linda Sargent, A More Perfect Union: Holistic Worldviews and the Transformation of American Culture after World War II (Oxford 2012). Yergin, Daniel, Shattered Peace: The Origins of the Cold War and the National Security State (Deutsch 1978). Unidentified suburban sprawl. Courtesy of Corbis.